Just checking in. Over the past few weeks I've had opportunity and the mental capacity to get back on the hobby, but the blogging will still be as and when. I'll do an update on my son at the end but the headlines are - he's doing well, back at school for a few lessons a day and he will start further treatment in January. On to the Knights, this is something I'd been thinking about doing ever since I got my first Knight - making one shoulder similar to Heresy Era Mk5 Space Marine armour. 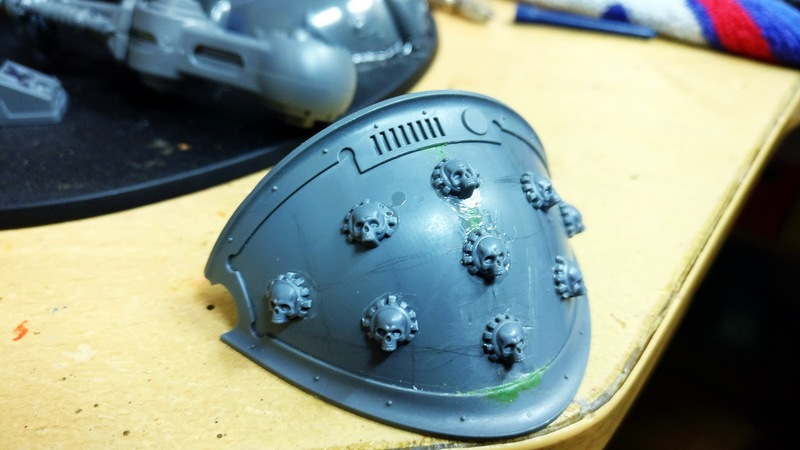 However, instead of studs I would use the extra Mechanicum skulls in the kit. 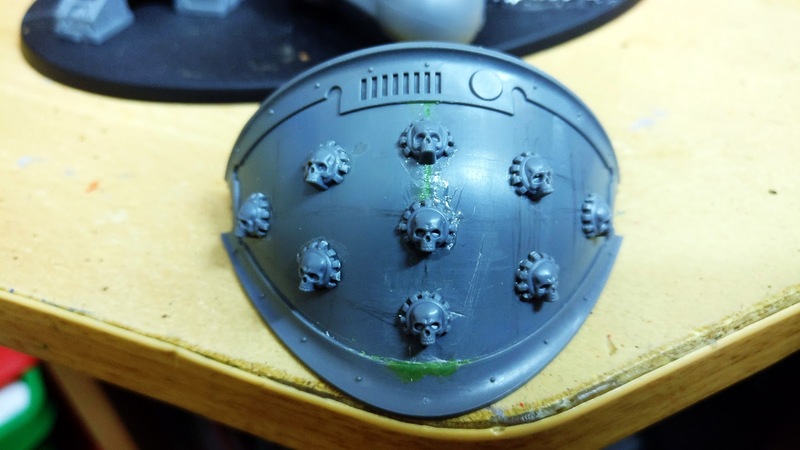 I'm not entirely sure it works, simple studs might have been better [and easier to arrange] but it's done now and all I have to do is figure out how to paint it. I had a thought to do the entire shoulder pad black/yellow stripes but the black/white studs might look odd, plain red is the obvious solution. And finally back to the legs. When Oscar's surgery/recovery was ongoing the prospect of painting was unthinkable but getting this pose locked down was challenging enough that my mind was unlikely to wander. 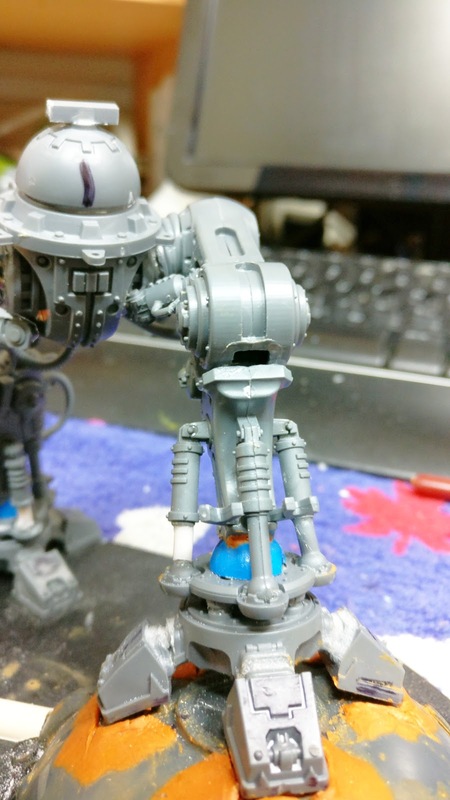 With the unexpected changes to its pose after the heatgun and gluing of the left leg the right leg needed to be twisted a bit. 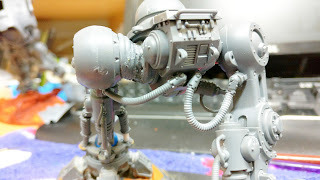 I kept trying to make the joint pipework fit but in the end I needed to extend the arc and suddenly remembered I had some spare bits of Magnetix, from when I remove the magnets for all my magnetising needs. 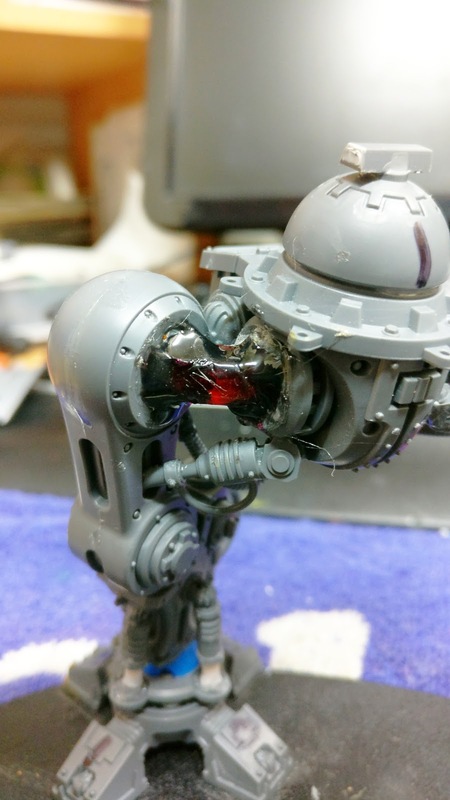 I drilled out holes in the hip and thigh socket. Super-glued and pinned it in place then added hot melt glue for a stronger bond and fill it out. I'll greenstuff some pipework [poorly] over the top of all this. I also butchered the groin pistons so they almost look like they're functional. The left hip also required a hamfisted kitbash on the groin pistons, they won't be too noticeable when it's done. I also had to adjust the joint pipework on this leg. There was quite a gap at the bottom of the pipework, so I cut a shim out of a rounded corner of sprue and filled it with poly cement to bond it all together. Greenstuff will hide the mess. The two trailing pipes were bent to fit. The left leg is at its maximum stretch and with both I cut the nozzle attaching to the leg so they could rotate to fit. The right pipe is bent SOOO much you can see the plastic has gone white between all the ridges to fit it in. 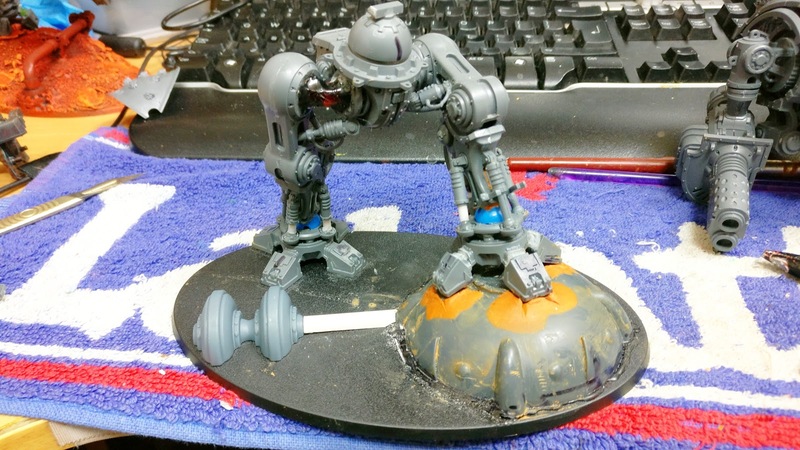 I also threw in some detail on the base. 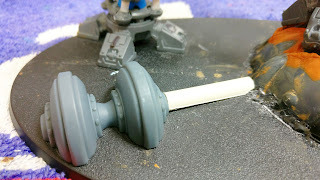 Some more bits from my Empire Strikes Back toy kit and a bit of tubing left over from the other Knights base, cut in half and it'll be attached clumsily to the tank. And you might recognise the piece as DSS-02 Shield Generator. Not sure whether I'll go all in as metallics or try and make glowing bits either side or make them glass insulators like my Predator Las-Cannons - what do you think? So the latest update is that Alder Hey hospital still haven't got a concrete diagnosis from their genetic tests - it is very complex and unique, but they have enough information to prepare a treatment plan. The bad news is they're considering it 'high-grade', but the good news is a recent MRI scan shows no change in the six to 8 weeks since he was first admitted. It might be aggressive but currently it is stable. My son will be having radiotherapy and a course of chemo starting in January. Full head and spine to try and nuke it all. It'll be 6 weeks, 5 days a week with the chemo starting week 4. Then 4 weeks off and then another 4 weeks of chemo. We've a couple of prep sessions beforehand and then we get to it. No prognosis as such as they just don't know but they talked about long term side effects and how that copuld impact him in his 50's, so they clearly believe this could be curative at least. Bottom line we're still in the same boat, we just have a timescale for the procedure. He is taking it all really well, he has his sense of humour ramped up and we're all looking forward to Christmas. January/February will no doubt be hard and right now I'm looking at cancelling going to one or both of the Last Chance Open and GT4. Neither of them really matter in the grand scheme of things but it's a discussion to have nearer the time. Anyway, I've done a fair bit of hobby so I will have plenty of pics to share when I finally get around to blogging in earnest again. In the mean time, stay safe. Warhammer Underworlds Garrek's Reavers pt1.